Karan Johar, the host of 2.0 First Look launch event, invited Superstar Rajinikanth on the stage, but he wasn't seen anywhere around. In a few seconds of time, Chitti made his appearance in front of Karan Johar, with the help of holographic projection. Here's an interesting conversation between Karan and Chitti before Superstar made his entry. Karan: Uh.. But...anyway, didn't they ban you, dismantle you, lock you up in a museum or something like that? Karan: Okay, you tried to hit on your boss's girlfriend right, Aishwarya Rai? How is that going on? Chitti: Ohh... That's a sad story, Karan. She friend zoned me. Ae Dil Hai Mushkil! Karan: Aah. You're so much updated about movies. So tell me one word about Akshay Kumar. Karan: Who is the King of Bollywood? Karan: And the Queen of Bollywood? Chitti: Madhuri Dixit, Aishwarya Rai, Sridevi, Priyanka, Deepika, Katrina, Anushka... Rakhi Sawant. Karan: Woah! Enough Chitti.. Now,let me ask you one tricky question. What do you know about demonetization? Chitti: I know about this. From my boss. Karan: Aaah. Anyways, the tagline reads, "the world is not only for humans". What does that mean? Aliens, robots? Who? Chitti: Sorry. I have been programmed not to reveal any details. If you have any questions on this, ask him. Then followed Superstar's entry. This interesting interaction between Chitti and Karan made the event so lively and enjoyable. 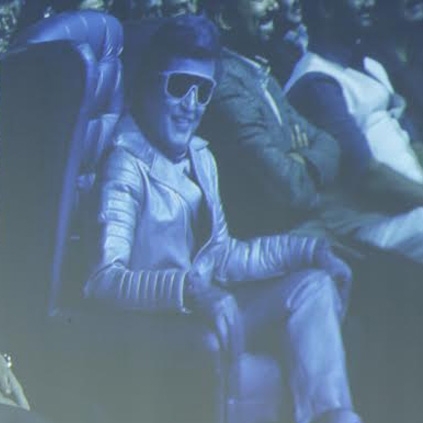 This ideation of Shankar to use holographic projection in the first look launch event is something to be appreciated and it should also be noted that the ace director made it a point to connect Sivaji with demonetization. People looking for online information on 20, Enthiran 2, Karan Johar will find this news story useful.